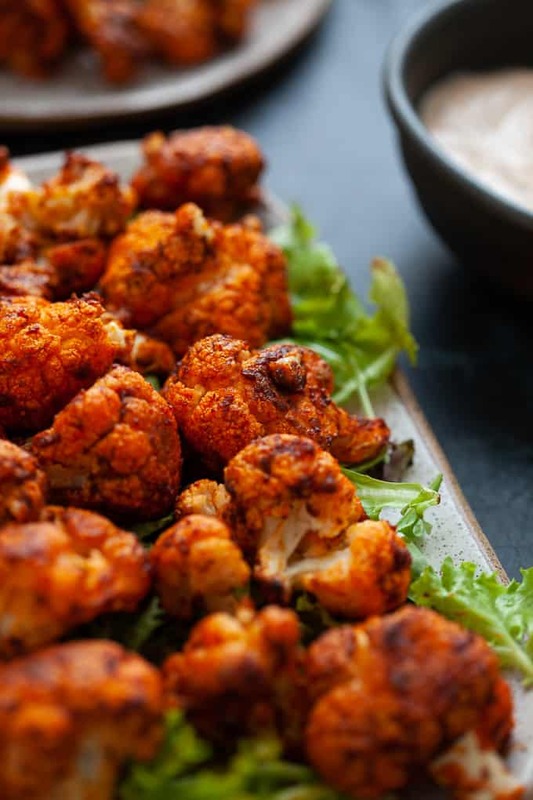 Spicy, smoky and totally satisfying, these harissa cauliflower wings are about to blow your mind. I love me some good cauliflower wings. I also (now) love me some good chicken wings. The last time I posted my Buffalo Cauliflower Wings recipe, I was a vegetarian. 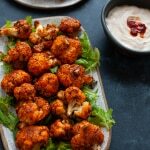 Now I no longer am a vegetarian (you can read about why here), but I still enjoy cauliflower wings. 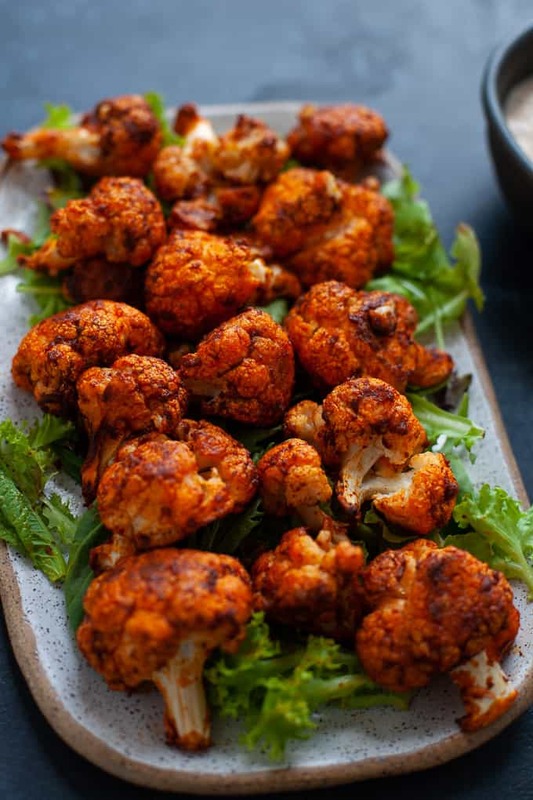 Battered roasted cauliflower doused in hot sauce – what’s not to love?! I’ve been thinking of this recipe for a while now since reading and writing about Middle Eastern cuisine being a top food trend for 2018. 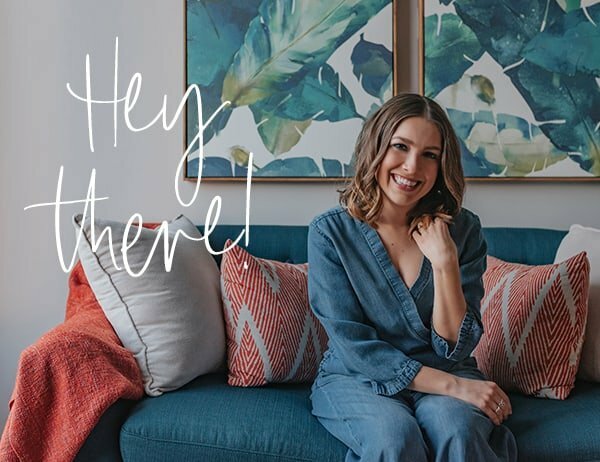 I realize we are now more than halfway through 2018 (although srsly when did that happen?!) 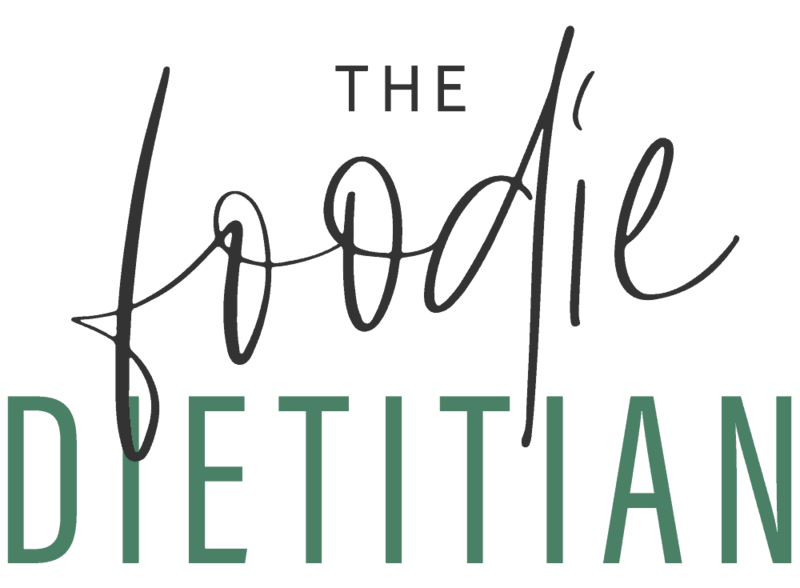 but it’s never too late to capitalize on a food trend. One of the staples of Middle Eastern cuisine is harissa. Think sriracha but smokier and more robust flavor. Harissa is a hot chili pepper paste made with roasted red pepper, garlic, and spices like coriander and cumin. You can use it on veggies, eggs, proteins, pizza, pasta, burgers, basically all the things. And it’s deeeeelicious on wings. 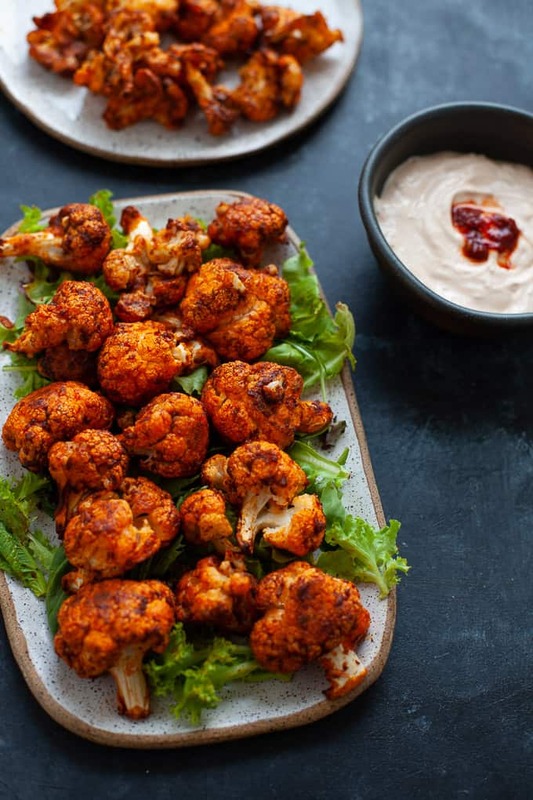 These harissa cauliflower wings are everything I’d hoped they’d be: spicy, smoky, robust. And totally satisfying. 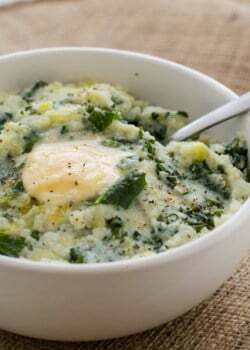 I had these the other night with potatoes and a corn/tomato salad (recipe coming soon) and my husband was like “where’s your protein?” I’m like I get plenty of protein in my diet, I don’t need a rule to have protein at every single meal I eat. And sure protein provides satiety but the cauliflower wings were so satisfying, I didn’t feel like I was missing anything. I feel like our culture is so obsessed with protein today but the reality is we all get plenty of protein in the American diet, we don’t need to stress about not having enough. Oh, and did I mention I made a bomb sauce to go with these wings?! Well I made it but can’t take the credit of creating it. This magical sauce is the genius of the Kitchn and calls for only 3 simple ingredients: yogurt (or mayo) + dijon mustard + sriracha (or chili garlic sauce…or more harissa). I made this the other night to go with shishito peppers and I was like this is the only condiment I want to use from now on. 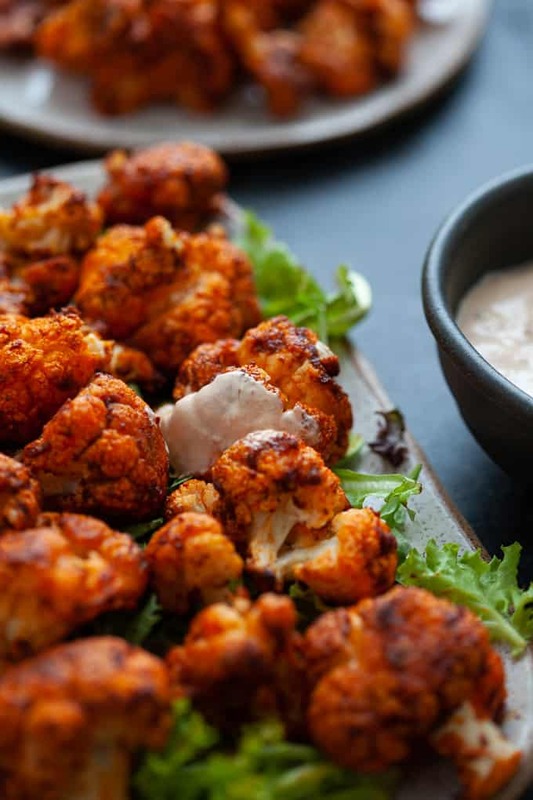 Hence magic sauce with harissa cauliflower wings. Combine flour, paprika and garlic salt in a small mixing bowl. Toss cauliflower florets in flour mixture and shake to remove excess before placing onto baking sheet. Bake cauliflower until browned and crispy, flipping over halfway through, about 30-40 minutes. In a medium mixing bowl, whisk together harissa and olive oil. 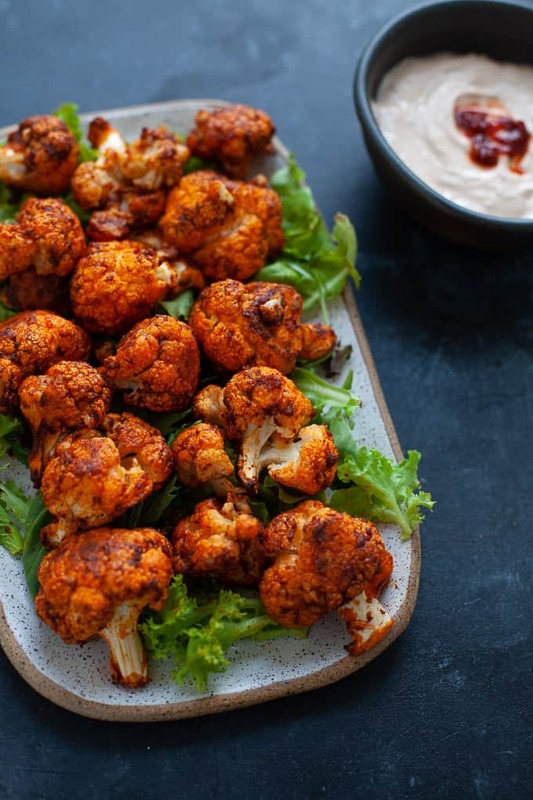 Toss roasted cauliflower in harissa mixture until evenly coated. Serve immediately (and with that magical dipping sauce from the Kitchn). 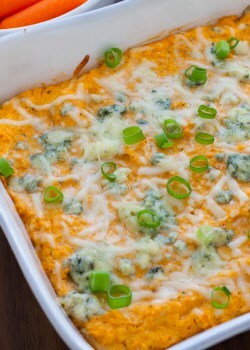 Can’t get enough cauliflower? 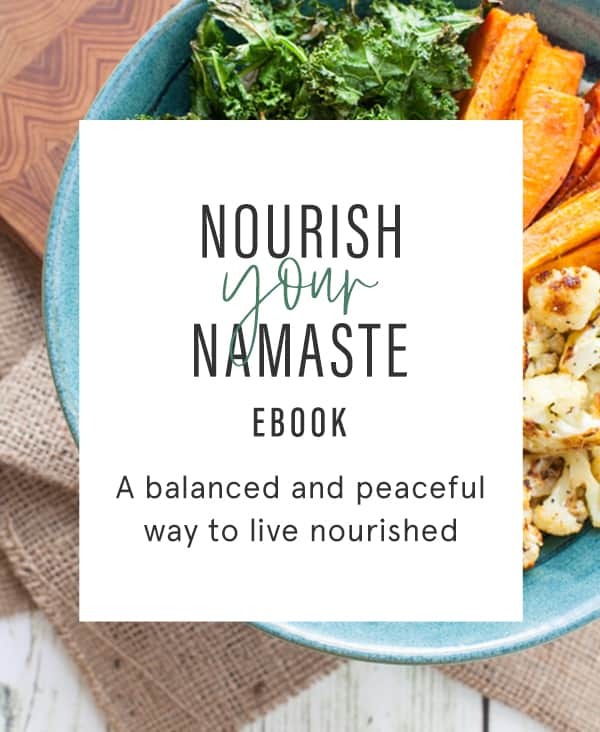 Check out the recipes below! 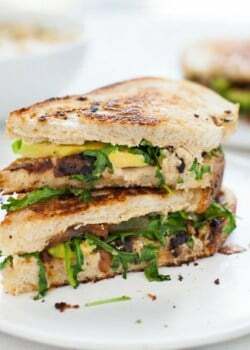 Looks very tasty! I’ll try it. Cannot wait to make this one at home. I’ve been adding harissa to pretty much everything lately. So good, right?! Hope you enjoy, Billy! Love the spiciness of harissa. Great way to incorporate it! I’m not a vegetarian either but you can’t go wrong with spicy, battered cauliflower. This sounds amazing and I can’t wait to give it a try. Oh amazing! I would love to get to Dubai someday! Hope you like it, Mandy! I’m going to try to get my boyfriend to try these!! They look awesome! Woot, woot! Hope he enjoys them! 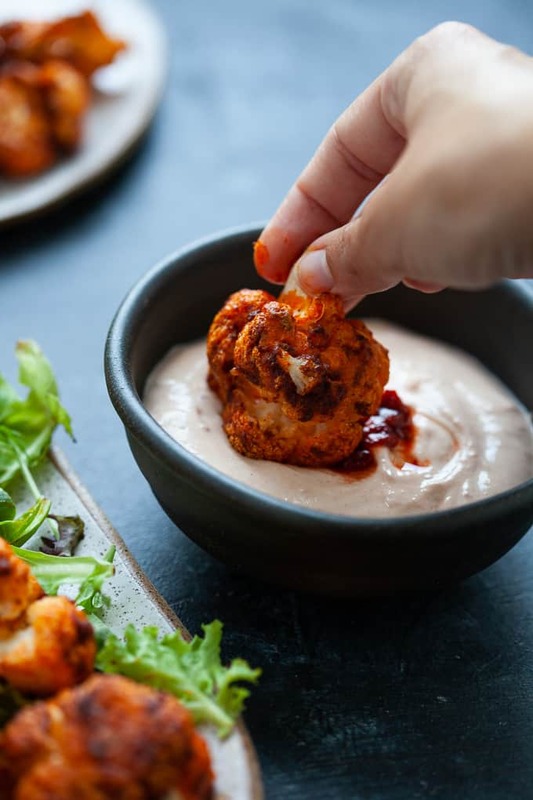 I’ve never made cauliflower “wings” but these look super good! :] I’m gonna have to try em’ soon! Thanks, Farrah! I think you’d love ’em.